Since 2005, under the slogan ‘Keep Green Days Green’, the Bedford Park Festival has recycled all waste on the Green Days weekend, earning praise from Greenpeace and Friends of the Earth. The Festival's campaign urges local people to look beyond the Green Days weekend and 'make every day a Green Day'. Read the ChiswickW4.com report about our recycling, from 2006. And this report from 2010, on our activities in 2008 and 2009. 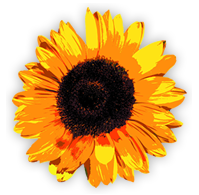 For Green Days 2018, our sponsor was ecoSHOPPERBox, a product of In Your Face Advertising based in Chiswick Park. 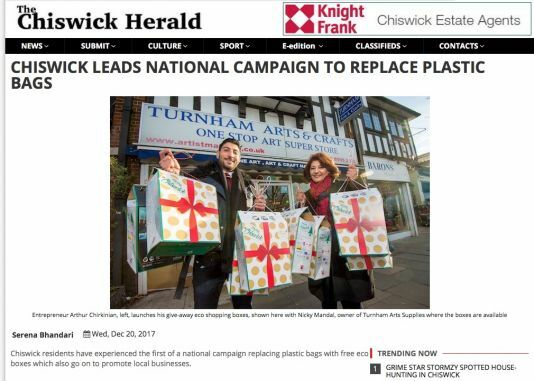 The company supports local businesses by providing free reusable, recyclable and biodegradable eco-boxes and is currently available at Turnham Arts & Crafts and other retailers. Thousands have been given away across Chiswick High Road and Turnham Green Terrace to date. You could find the boxes on several stalls on Green Days, including the plant and church stalls. Our relationship with EcoSHOPPERBox was the latest in a long line of partnerships in which we have tried to cut plastic. In 2009 on the Green, GreenTomatoCars proclaimed on their linen bags 'Plastic bags are rubbish!'. 2018 was the first year that we used 100% reusable drinking units for all alcoholic beverages. Pints, Pimms, half pints and wine are ALL now served in reusable containers that I will bring out year after year. It's a huge amount of work in terms of cleaning the dirty containers, repaying the deposits of £1 for EVERY unit and storing them for next year. But I don’t consider we have a choice. Its just plain wrong to throw away so much plastic that ends up in land fills or worse, floating in our seas and oceans. The church have invested a substantial sum of money in these containers [approx £1000] so well done St Michaels, a forward-facing church in anyone's book. In short we have revolutionised how much waste we create in the beer tent. 2018 will see only a tiny fraction of waste compared to the beer tent 4 years ago. Powerday provides Green Days with a free supply of waste containers and free waste removal. As all waste can be put in the same bin, it makes it easier for everyone to recycle their rubbish and keep the site clean. All waste will then go to Powerday's local waste transfer station where it will be sorted and 100% recycled or used for energy, meaning that no waste will go to landfill. We are also working with a number of local organisations to get you out of your car, not only for Green Days but for the rest of the year. At the Cycle Zone on Green Days, you can get a free service, security marking, information and maps. For those who are thinking of taking to a bike, advisors are on hand to help you differentiate a cargo from a hybrid, and gain the confidence to take to the road. There is now also an Electric Vehicle Zone, supported by Blue City and Tesla.